Simple, applicable, and without pretense, One Piece of Paper provides a model for real leadership in the real world. 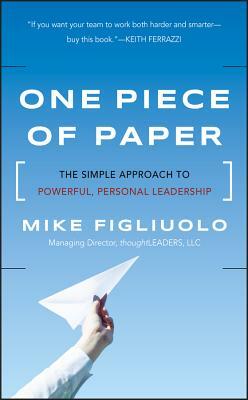 MIKE FIGLIUOLO is the founder and managing director of thoughtLEADERS, LLC, a professional services firm specializing in leadership development, and a nationally-recognized speaker and blogger on the topic of leadership. An Honor Graduate from West Point, Figliuolo served in the U.S. Army as a combat arms officer. Before founding his own company, he was an assistant professor at Duke University, a consultant at McKinsey & Co., and an executive at Capital One and Scotts Miracle-Gro. He lives in Columbus, Ohio.